Within just seven years, use of fabric storage warehouses grew to cover a massive 56,000m2 on land at the Port of Tilbury in Essex, UK. imports. A second building of 60m wide × 138m long was also developed and installed. This building’s length was subsequently increased to 276m. A third link span structure was then extended to provide a covered area of 60m wide × 300m long. Meanwhile SCA Shipping Agency chose a 24m × 54m BVE for its site at Tilbury. Then in 1997 Rubb designed and constructed an 8,560m2 warehouse for the storage of paper products, bringing the total area covered there by Rubb facilities to more than 56,000m2. Rubb building systems allowed the port to react very quickly to customers’ requirements and erect covered warehouse facilities, which can be extended or relocated based on future trade patterns, at very short notice. Ports and marine developments, which are often built on reclaimed land, can also be prone to differential settlement. Rubb fabric structures are not only lighter than traditional fixed buildings, they can accommodate this differential settlement. The translucent fabric roofing system allows natural light to illuminate the structure and helps save on energy costs. These advantages ensured the growing success of fabric warehouse solutions in the ports, marine and warehouse logistics sectors. 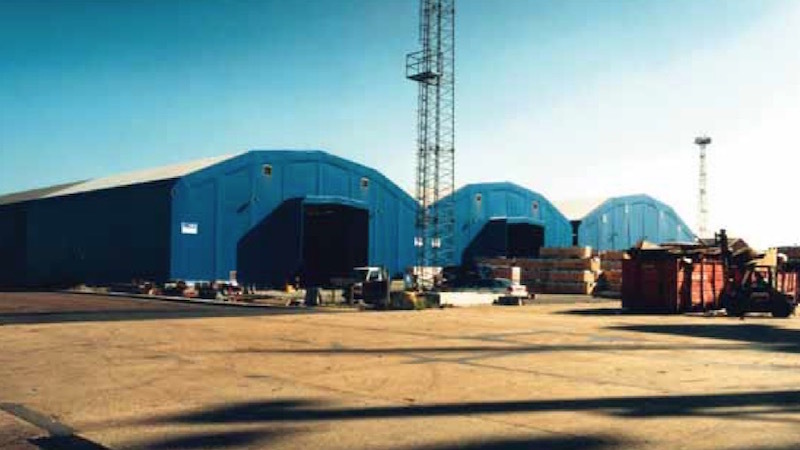 In 1997 the new 40m × 214m single span building was linked by two short covered drive-through tunnels to an existing 60m × 325m twin span Rubb port building which had already been extended on two previous occasions. Like all Rubb buildings, port warehouses are built using a structurally engineered, hot dip galvanized steel frame, covered with a high-tenacity PVC coated polyester membrane. This structure was used to store and protect forest products from the elements. Over the years a number of structures at Tilbury have been dismantled, converted and relocated at three different berths at the port. In 2004, two of these sections were relocated again with dismantling and re-erection carried out by local contractors. The ability to relocate Rubb structures, no matter what size, enables port authorities to develop their port to suit the needs of existing and new customers. A number of Rubb structures are still used to this day at the Port of Tilbury.They include a twin span 35m × 115m BVE, a twin span 30m × 102m BVE, a 24m × 85m BVL, a twin span 30m × 66m BVE, a twin 30m × 185m BVE, a twin 30m × 140m BVE, a single span 40m × 214m BVE and a 24m × 54m BVL. Rubb Buildings Ltd is globally renowned for the design and manufacture of custom- made relocatable engineered fabric structures. All products are designed and manufactured at Rubb’s UK plant at the Team Valley Trading Estate in Gateshead, Tyne and Wear. The company was founded in 1977 and has a proud history of delivering innovative and quality structures to a wide range of clients.